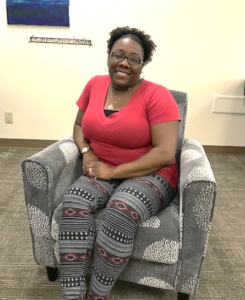 Associate Lashawnda Wright’s New Hope journey to her current position in the AIM Program started about three years ago. At that time, Lashawnda was working for another agency when an associate encouraged her to apply at New Hope. New Hope is so thankful for that referral because we have gained a terrific associate in Lashawnda. At the time Lashawnda started working at New Hope, no residential shifts were available, so a position Day Services at Payne Road was suggested. Conducive to her family obligations, Lashawnda accepted the Day Services position. It was a perfect fit as it allowed her to balance work and home life needs. She worked in Day Services until her transfer to the AIM (Achieving Inclusion and Meaning) Program in January of this year. 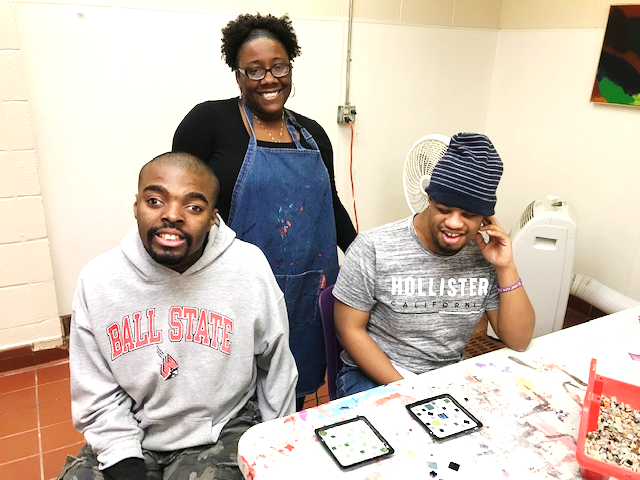 For Lashawnda, engaging with the clients has been the most rewarding part of her job; although, she certainly has encountered challenging times. Her favorite Day Services memories are of the morning Uno and Farkle card game tournaments. These games provided a positive and fun start to the day for many of the individuals who participated. She also really enjoyed the outings with the clients, especially when volunteering with Meals on Wheels. The outings and volunteer experience with the clients is what precipitated her transfer to AIM. Amanda Boyd, Manager of AIM, was planning to take a day off and asked Lashawnda to help since she was familiar with the Meals on Wheels procedure. Lashawnda did so well as a fill-in for Amanda that when the second AIM group was added, again, it was the perfect fit. Lashawnda has greatly enjoyed the interesting and fun opportunities the AIM Program has provided to New Hope clients. She’s very upbeat and easy going, and her AIM individuals enjoy being around her because she is a great listener and has a good sense of humor. Lashawnda really is a game guru! close and have been a source of support for each other over the years. Lashawnda’s faith and involvement in her church are also important to her. She and her husband somehow find time to bowl in leagues, so the clients in AIM better watch out if they go bowling with her! Our thanks to Lashawnda for exemplifying the Core Values of Dedication and Service, and for being such a positive role model to the clients she serves!